Info: Created on 17th January 2010 . Last edited on Thu, 4th April. The pixel view reveals the true beauty of this font. Very good work. It's coming along well - I look forward to seeing this develop. Congratulations! FontStruct Staff have deemed your FontStruction worthy of special mention. 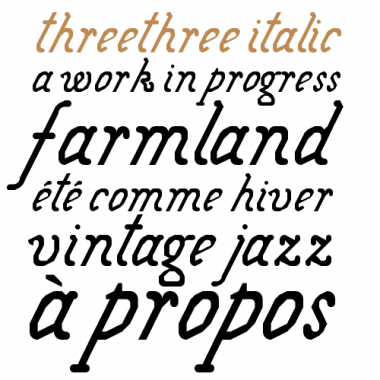 “Threethree Italic” is now a Top Pick. thanks for the comments & top pick! i'll try to finish the font (with uppercase figures) later this month when i'm back in town. blimey, this reminds me of pirate type. very nice and very unique.